wish you a warm and very Merry Christmas! Thank you for all your kindness in this world of blogs. Always lovely. Great picture and color contrast with the red truck in the back. Have a great day with all the little people. Bet it was exciting at your house today! Here's hoping that you're getting to relax a bit by now. Oh I love that photo. It's awesome to see all FIVE of your daughters together with you. Hope you had a Merry Christmas! What a beautiful girls. Wow! Merry Christmas to you too! I love the picture of you and your girls, each of you are beautiful! Thank you for making Christmas morning a very happy one at our house (my daughter loves her very bias skirt ;) You always have great ideas to share and I look forward to the up coming year of blog posts from you! My little one and yours could be sisters! Merry Christmas! Hey Katy- it is your old neighbor sarahP - I have a sewing question. I am looking for a good reliable sewing machine that won't require much maintenance. Any advice? 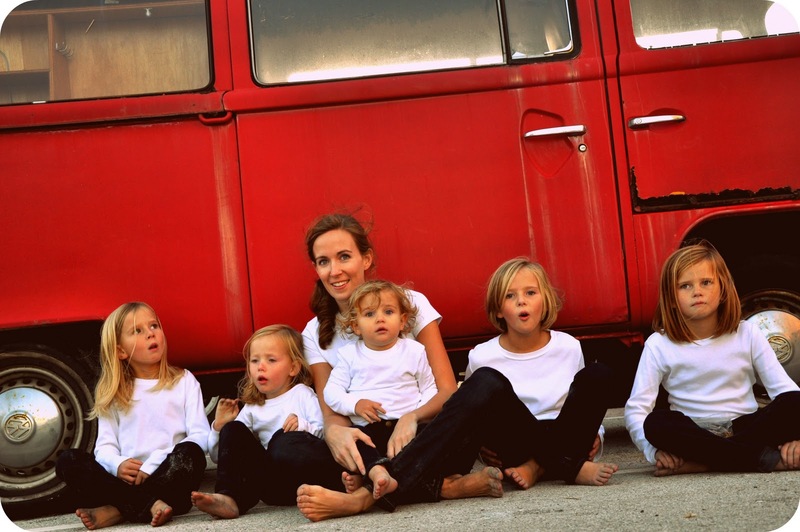 I first stumbled upon your blog yesterday when I saw this most gorgeous picture of you and your sweet girls. We have 2 boys and we wanted (i still want) more children. You are my hero ! I LOVE the snow scene photo and the last one - with beautiful you and your adorable girls.